couldn’t be easier. Photo courtesy Kikkoman. Ever since we discovered them at Japanese restaurants, our breadcrumb of choice has been panko, the crispy bread crumb used in tempura, tonkatsu and crunchy sushi rolls, among other recipes. They’re crunchier and more flavorful than conventional bread crumbs. Panko is actually bread “flakes” rather than breadcrumbs. The difference is that conventional bread crumbs are ground into tiny bits, while panko are small flakes. Panko are made from specially baked, oblong, crustless loaves. The larger and lighter flakes produced coat the food without “packing” like regular bread crumbs. They allow foods to stay crispier longer. 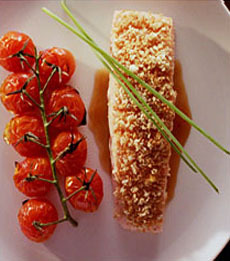 Panko can be used with baked or fried foods. Kikkoman Panko Bread Crumbs are unseasoned, making them perfect for sweet recipes, too. Try them with crab cakes, fried fish, chicken and chicken nuggets; and in meat loaf and meatballs. They’re perfect for fried zucchini, mozzarella sticks, onion rings and stuffed mushrooms. Sprinkle them on casseroles before baking, then dot with a little butter for a light, tasty topping. Garnish pasta and noodle dishes, including lasagne and mac and cheese. Toss a few onto cottage cheese and yogurt. Add a crisp, crunchy topping to everything from French toast, coffee cake and fruit fritters, to crisps and crumbles and ice cream. Check out the recipes on the Kikkoman website. After you see and taste the difference, you may never go back to ordinary bread crumbs. You can find panko in the Asian products section of many supermarkets; at all Asian food markets; and online. 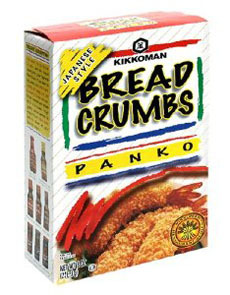 Kikkoman panko breadcrumbs are certified kosher by OU. Enter your original recipe by March 26th, 2012. It can be an appetizer, side dish, main dish or dessert, as long as it’s creative, delicious and original. The winner in each category will receive a $1,000 prize and the winning recipes will be added to Kikkoman’s recipe database. Here are the contest guidelines for the recipe contest. Look for panko in the Asian products section of your market. Photo courtesy Kikkoman.